I have always known that I would homeschool my children so I started with pre-school. Yesterday, my eldest son started Kindergarten and it has been such an exciting time for our family. I take my role as a home educator very seriously and this has lead to hours of researching the best programs and educational tools available. I was aware of the Down Load N Go series but never quite understood how valuable a resource it could be until I recently experienced the new Summer Sensations title. With just a simple click of the mouse, I had our very own unit study available for use. We even learned how easy it is to create a lapbook (something that had initially felt overwhelming until I tried it). All three of my children were able to participate at different levels and our favorite parts of the study were the video links, including Ride The Water Slide and One Year in Forty Seconds. We discussed the summer season and it inspired us to take a nature walk and view summer up close. My children then created their very first lap book in honor of summer in Florida. Even better is that some of the components that were a bit too advanced for this year will be fresh for use again next year giving us maximum use for a minimal investment. 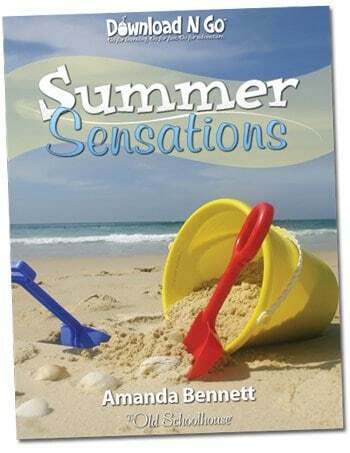 I was so impressed with Summer Sensations that I decided to explore other titles in the series and was delighted to find lots of interest, including Autumn Treasures (my FAVORITE time of the year) and Davy Crockett (my husband is a direct descendent so even he was interested in this one). I am intrigued to learn more about the new release Chocolate Challenge because who can resist learning about chocolate? I teach storytime at the library, so it would be nice to see if there is something I could take from here and use it. Astonishing Animals sounds interesting. I am part of your blog frog community. I love them! We are currently going through Davy Crockett, and it is my favorite right now. Good thing that you are teaching your kids. Not all mothers cannot find time to do that. I’m a homeschooling mom too. These look like great resources. I’d choose “Sunny Seashells” because my son has been asking lots of questions about shells lately. We love Download N Go. We’re working on our 4th unit. Can’t say that I have a favorite because they almost all look good. I really want Expedition Israel though. I like the Davy Crockett download study. Love it! The study about horses is what I’d pick since my daughter is nuts about horses right now.